It is said that Love can heal any type of sorrow and bring back smile on one's face. This saying goes exactly with the life of American journalist, Hoda Kotb. After facing a failed marriage, she was in search of love and guess what she found and it and is happy nowadays. American broadcast journalist, Hoda Kotb came to limelight not just from her career but also from her personal life. Kotb was married to a former tennis coach, Burzis Kanga. On 3rd December 2005, the couple tied the knot in Punta Cana in the Dominican Republic in the presence of their families and friends. The couple met for the first time on Valentine's Day during an event for the American Heart Association. In May 2005, Kanga proposed her and eventually tied the knot. The couple signed their divorce on the same occassion (Valentine's Day) when they encountered one another for the first time. Following her divorce with Burzis, she underwent mastectomy and reconstructive surgery following her breast cancer and has then been announced cancer free.. Her struggle through those days was documented on the Today Show and was portrayed on television after she was announced cancer free. She also underwent reconstructive surgery for the damage done by mastectomy. Later, Kotb went further to reveal her relationship with lawyer Jay Blumenkopf calling the relationship a real thing between the two. She went on further to state that her previous marriage with Burzis seemed like the real thing but did not turn out to be so. Jay’s two daughters are said to have set up a blind date between the two which turned out to create a spark between the two and give rise to a stable relationship. However, the relationship did not turn out to be the real thing as Jay supposedly dumped Hoda as he saw no future with her. A successful litigator, he spent his time between New York and Florida and spending too much time apart might be what caused them to break up. 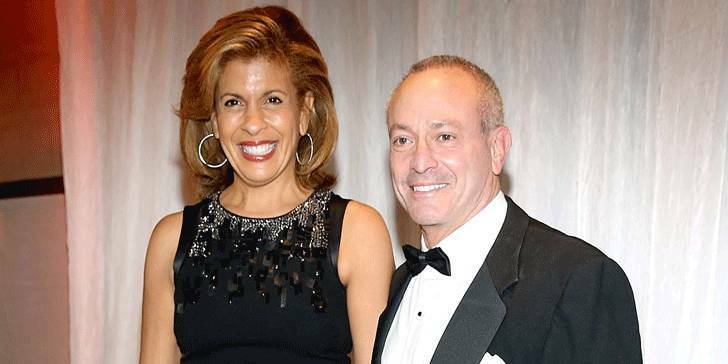 After Jay, Hoda is said to have been dating New York financier Joel Schiffman who works for an investment firm in New York and has a daughter. She said in January 2015, that she has been in a relationship with Joel Schiffman for two years. She adopted a baby girl named Haley Joy Kotb in February 2017. Kotb met Joel in the summer of 2013 when speaking at an event for Wall Sreet professionals. She was signing books after her talk when Schiffman approached her. Kotb shared the meetcute on the talk show Bethenny before revealing his identity. Though they had been dating for two years, she kept the relationship private until recently when she went on to reveal how much in love she felt and how good it feels to be in love. They were spotted hanging out together on a beach in Florida and after having revealed her boyfriend’s picture, she admitted that she felt relieved. Hoda has always been very open about her affairs but the reason she split up with Burzis has never been revealed by any source or by her. Her career is plummeting into the heights of success and her present relation is seemingly heading towards marriage. Her past relationship with Burzis is long forgotten and one would only hope for this awesome presenter to lead a happy, prosperous and secure life. Hoda Kotb was born on 9th August 1964 in Norman, Oklahoma under the birth sign Leo. Kotb is American as per nationality and as far as her ethnicity is concerned, she is White. She is the daughter of A.K. Kotb and Sameha Kotb. She has two siblings, a brother Adel Kotb and a sister Hala Kotb. In 1982, Kotb graduated from Fort Hunt High School. In 1986, she earned a Bachelor of Arts degree in broadcast journalism. Kotb did his first on-air job after college at WXVT in Greenville, Mississippi. She is popularly known as the co-anchor of the NBC News Morning show Today.